HepG2-Lucia™ AhR cells are engineered from the human HepG2 hepatoma cell line for the study of the aryl hydrocarbon receptor (AhR) genomic signaling induction (see details), by monitoring the activity of the Lucia luciferase reporter protein. AhR is a ligand-dependent transcriptional factor widely expressed in barrier tissues. Notably, AhR plays a important role in gut-microbiota and host's immune homeostasis . HepG2-Lucia™ AhR cells, which express endogenous AhR, are highly relevant for the detection/screening of AhR ligands in food or environmental samples . These cells express the secreted Lucia luciferase reporter gene under under the control of a minimal promoter coupled with the human Cyp1a1 gene entire regulatory sequence, which contains six dioxin responsive elements (DREs). 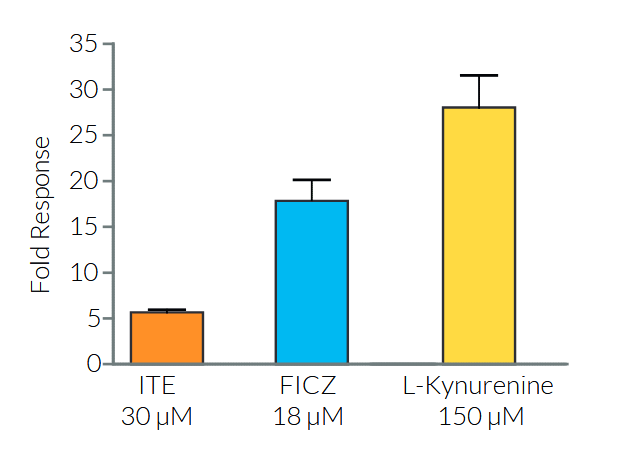 As a result, these cells allow to study the AhR genomic signaling pathway, by monitoring the activity of Lucia luciferase in the cell culture supernatant when using the QUANTI-Luc™ or QUANTI-Luc™ Gold detection reagents. HepG2-Lucia™ AhR cells are resistant to Zeocin™. Read our review on AhR's key role in the intestinal microbiota and immunity. 1. Lamas B. et al. 2018. Aryl hydrocarbon receptor and intestinal immunity. Mucosal Immunol. 11:1024-38. 2. Gao J. et al. 2018. Impact of the gut microbiota on intestinal immunity mediated by tryptophan metabolism. Front. Cell. Infect. Microbiol. 8:13. Induction of AhR activity by tryptophan byproducts in HepG2-Lucia™ AhR cells. The cells were incubated with 30 μM ITE, 18 μM FICZ, or 150 μM L-Kynurenine. After overnight incubation, the AhR activation was assessed by determining Lucia luciferase activity in the supernatant using QUANTI-Luc™. Data are expressed as fold responses as compared to non-induced cells. Reporter activity has been verified by functional assays. HepG2-Lucia™ AhR cells are guaranteed mycoplasma-free. 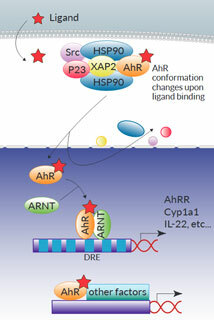 The aryl hydrocarborn receptor (AhR) is a ligand-dependent transcriptional factor widely expressed in barrier tissues . AhR plays a key role in gut-microbiota and host’s immune homeostasis, not only in the intestine but also at distant sites . Besides xenobiotics, including the prototypic AhR agonist 2,3,7,8-tetrachlorodibenzo-p-dioxin (TCDD), a variety of dietary-derived AhR ligands have been identified, many of which are byproducts of tryptophan (Trp) metabolism . Inactive AhR resides in the cytoplasm within a Hsp90:XAP2:p23:Src protein complex. The AhR canonical genomic signaling pathway occurs as follows: upon ligand binding, the complex undergoes conformational changes and translocates into the nucleus. 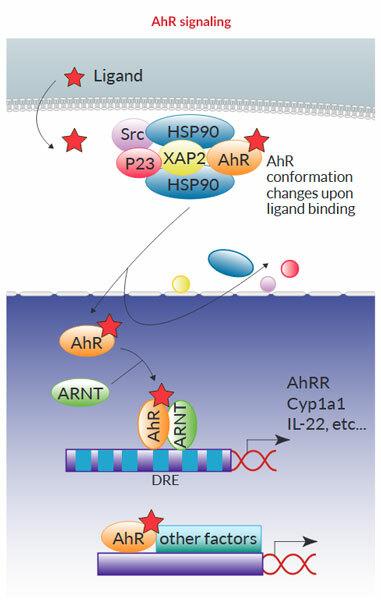 AhR heterodimerizes with AhR nuclear translocator (ARNT) before binding to dioxin response elements (DREs) in the upstream regulatory regions of AhR target genes, such as the cytochrome P450-dependent monooxygenase Cyp1a1, the AhR repressor (AhRR), and the IL-22 interleukin. Of note, non-canonical AhR signaling pathways have also been reported, either at the genomic level through association with other transcription factors (e.g. NF-κB), or at the non-genomic level (e.g. through the release of the Src kinase) [2,3]. 3. Park JH. et al., 2018. Kynurenine promotes the goblet cell differentiation of HT-29 colon carcinoma cells by modulating Wnt, Notch and AhR signals. Oncol Rep. 39(4):1930-8.